cab of exceptionally rare Strawberry Amethyst from Mexico. A single lot of this material was brought out in the 1970s and no more has ever made it to market. I obtained several pieces from a friend to cab for him and took two stone in place of payment. The red needles are hematite inclusions aligned with the crystal structure. The wire is 24 gauge square Sterling Silver for the main wires and 22 gauge 1/2 round for the wraps. Wrap done by my wife, Caren Johannes. The stone is approximately 25 mm wide and 35mm high and about 45 carats. Darn pretty stone and great wire wrap too. Lovely stone. I like the geometric lines of both the stone and the wrap, a nice complement to the organic color gradient in the stone itself. Is this the same or similar to what they call “strawberry quartz,” a stone that sparkles tremendously, in small pinpoints? There was also some extremely rare strawberry rutilated quartz that I found in Tucson in the mid 80's. 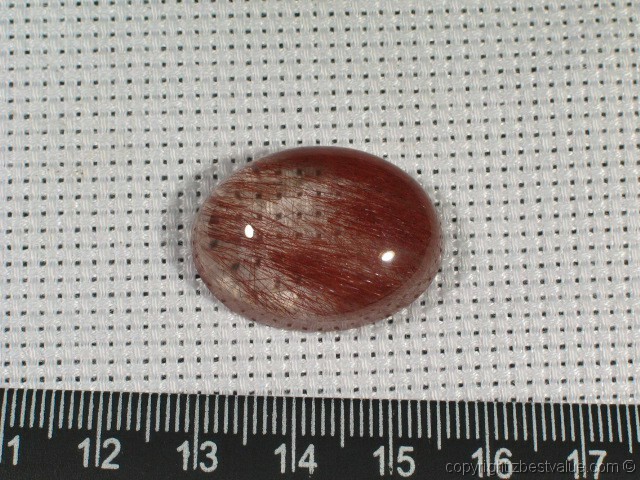 Rutilated and from Brazil with absolutely RED rutile inside. NOT any shade of orange. As far as I know this hasn't been seen in the market since then. I never could figure out how to put a price on something this rare. Nobody knows about it or has seen it so how do you get anyone to appraise it? I love that stuff! I’ve seen pieces that were faceted in Germany.